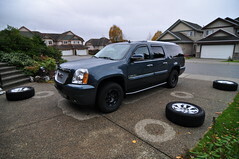 I put the winter tires back onto our 2007 GMC Yukon Denali XL this morning. It wasn't the ordeal it was last year, but it was snowing/hailing lightly while I was doing it. I don't know if we'll see the record snowfalls again, but the local ski hills and Whistler Mountain have all opened their season early.